Didn't find that tool you wanted under the Christmas tree or in your stocking? Don't worry because there are still plenty of deals to be found. A number of sites are offering After Christmas Sales that are just as good as the before Christmas sales. First off, if you have coupons from before Christmas, they might still be good. Many coupons do not expire until December 31 and can still get you a great deal. Lee Valley doesn't usually have too many special deals, but I always love to take them up on their FREE SHIPPING offer when it becomes available. If you can come up with $40 worth of things to purchase at Lee Valley, they will give you the gift of free shipping until 1/7/2013. Lee Valley has a ton of cool woodworking tools, hardware, and gardening tools, so don't be surprised if you checkout with more than you expected. Harbor Freight is always looking for an excuse to sell you something at a discount and the day after Christmas is no exception. 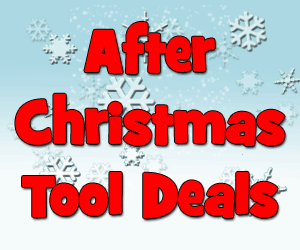 Harbor Freight has a special after Christmas sale page up, but if you can't find what you want on sale, they still have a Harbor Freight 20% off coupon and other coupons that are good through the end of the year. Up through 12/29/12 Sears has discounted Gladiator and Craftsman garage storage solutions that are priced above $99. If you are looking for a quick way to organize your garage or work-space, Gladiator and Craftsman have plenty of options for you. SHOP 25% off $99 Gladiator & Craftsman garage organization.